I’m going home next June. I was born in Northern Ireland, and lived with my Protestant minister father and my mother and two siblings in County Armagh, just by the border. In the seventies (yes I am that old) South Armagh was known as “bandit country” because it was such a dangerous place to be during the Northern Irish Troubles. It was a stronghold of support for the IRA, and sniper attacks, bombings and cross-boarder smuggling were common. My parents worked for the peace movement and often attended Corrymeela on the Antrim coast – a community still active today, working towards peace and unity throughout Northern Ireland. Every Sunday my father would preach at one Presbyterian church in the north then cross the border to preach at another in the south. In those days the most important question was not whether you believed in God or not, but what kind of God you believed in – Catholic or Protestant. Our home was surrounded by endless green fields and I remember the British soldiers landing their helicopters just behind the house and coming in to say hello. My mother would make them tea or a meal and sometimes they would even read us stories. My parents took no sides, but in those days you had to tread carefully. Things started to happen. A rock was thrown through my bedroom window, and if my mother had not shifted my cot that day I would have been killed. Our dog Sandy, a very stupid but very beautiful Irish Setter, was shot dead. One day my father was told that he was on an IRA hit list and that he should be very, very vigilant. My parents made the huge decision to shift the family to the other side of the world. For a while it was going to be America, until a church in New Zealand made an offer. I’ve been here for many years now, and I’m a proud Kiwi. 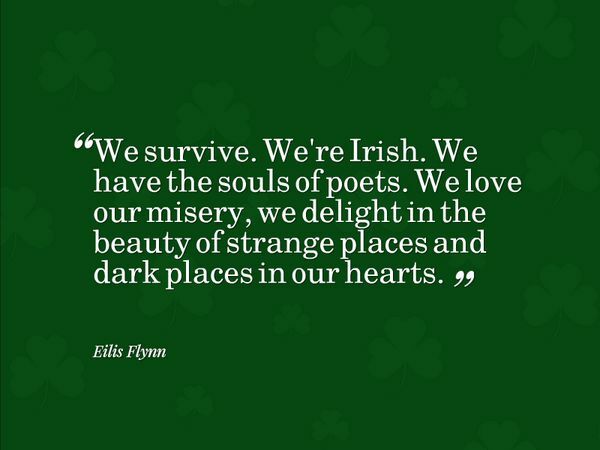 But part of my soul – a very big part, which can drink friends under the table and tell stories and laugh endlessly and sing and lose my temper easily and luxuriate in melancholy and believe in the power of the mystical – is Irish still. I think the place where we were born and where we spend our first few formative years plays a huge part in who we are and who we become. It never leaves us. It whispers to us in dreams. It calls out in song and literature and longing. The last time I was in Ireland I was in my twenties and I loved it, but I was on my OE and more interested in ripping around Europe with friends and having a rollicking good time (thank you to all those who helped; you know who you are) than in spending time really soaking Ireland in. Many years have passed since that trip, and for around five years now I have felt a growing longing to get back. It’s like an ache in the pit of my stomach; a homesickness; a yearning I couldn’t quite put my finger on until a wee while ago when my partner flew to London for work. After landing in Heathrow he called to tell me that he had flown over Ireland and it was unbelievably, beautifully green. I promptly burst into tears, which pretty much gave me a clue. So finally, I’m going home. I’m going to retrace some of my family history (I’ll be spending a few days in Scotland, too, where my mother is originally from), I’m going to explore and hike and go to pubs and talk and drink and maybe even sing. I am an Irish girl after all. I’m also going to be doing some research for a short story collection I’m writing. Some of the stories are set in Northern Ireland, and I need to breathe the air and feel the land beneath my feet and talk to the people before I can really bring the stories to life. But most of all, I’m going because I want to go back to the beginning; to where my story started. We all need to know where we come from. We need to sink our roots down deep to draw sustenance from our heritage and our history and our earliest memories. I am going on my own for a month, and part of me is terrified because I have never been away from my daughter for so long. But this is something I need to do, and my Irish/Kiwi heart beats just a little bit quicker every time I think of it. Can’t wait to write about it.